On snowy or icy Sunday mornings, please use your best judgment about driving to church. We will cancel Sunday Worship when officials advise non-emergency vehicles to stay off the roads. Our policy for cancellation of mid-week activities is to do what Brookfield Public Schools decide, on their website at www.brookfield.k12.ct.us or on their phone message 203 775-7700 (x3). If there is power, weekend event cancellations get posted on this website and/or answering machine (203 775-1259). 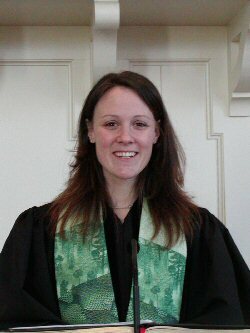 The Reverend Jennifer (DeBisschop) Whipple was ordained in the Naugatuck Valley Association in December 2005. Jennifer resides in Naugatuck with her husband and two children. She has been a part of the CCB family since August 2005. Jennifer graduated with a B.A. in Sociology from La Salle University in Philadelphia and an M.Div. from Yale University Divinity School. Before coming to CCB, Jennifer worked for the Waterbury YMCA with its Aftercare and summer camp programs, teaching youth to be counselors and helping to lead challenge courses and teambuilding workshops. She also spent 6 months living in the Dominican Republic where she worked with the Good Samaritan Mission in La Romana. This page was last updated on 02/08/2014 09:04 AM. Please send any feedback, updates, corrections, or new content to .